Actin comet tails are actin structures formed by the dynamic polymerization of actin beneath some species of intracellular bacteria belonging to the genus Listeria, Shigella, Ricketssia, Mycobacterium and Burkholderia. Once bacteria gain entry into the cytosol, the endocytic vesicle that contained them is lysed. These bacteria induce the polymerization of actin at the surface of one pole, forming actin structures that resemble ‘comet tails’, which use the force from actin polymerization  to propel them. Bacteria can achieve speeds of 3 to 87 µm per minute. Some highly motile bacteria can drive membrane protrusions from the host cell into neighboring cells. These protrusions can be lysed and engulfed by neighboring cells in a process known as paracytophagy, enabling the spread of infection . Extensive study of comet tails in Listeria monocytogenes has provided insight into the workings of lamellipodia in eukaryotic cell movement. The L.monocytogenes comet tail is similar to lamellipodia in that actin polymerizes rapidly in the part of the actin tail near the bacterial surface. Actin filaments in the tail distal from the bacteria remain stationary. This arrangement is akin to the leading and trailing edge, respectively, that is observed in lamellipodia of a rapidly moving cell. Actin depolymerizing factor ADF/cofilin is also associated with both comet tails and lamellipodia, where it contributes to rapid actin turn over. 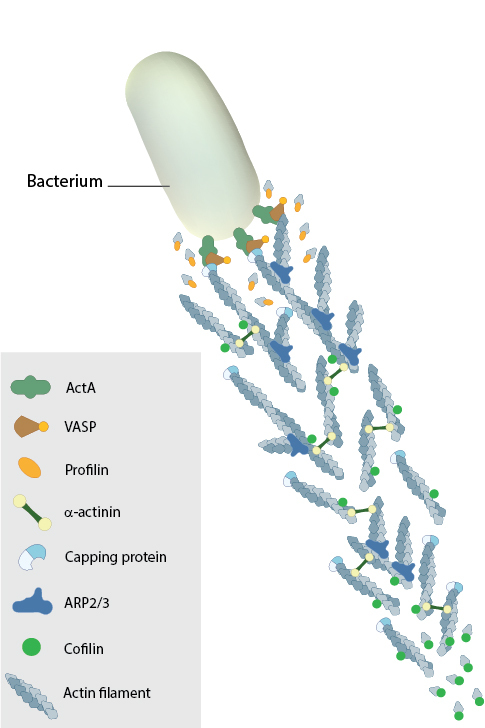 In L.monocytogenes, the bacterial surface protein ActA is a nucleation promoting factor akin to WASP/N-WASP in mammalian cells. It stimulates Arp2/3 complex-mediated actin polymerization. The proteins VASP and profilin promote actin filament elongation in comet tails. Both comet tails and lamellipodia are characterized by the presence of F-actin crosslinking proteins: fimbrin and α-actinin in comet tails and filamin in lamellipodia .